The Mecca Group is best known for injecting fun back into the world of bingo, with over 95 bingo halls now operating in the UK. It’s also managed to recreate the joy and community spirit of bingo on its online site. Players can log in and play bingo in one of the many online rooms, including theme rooms like Deal or No Deal, The X Factor, and Britain’s Got Talent. In addition to its main bingo offerings, Mecca Bingo has been expanding, offering players online video slots and scratch card games to play in between bingo calls. 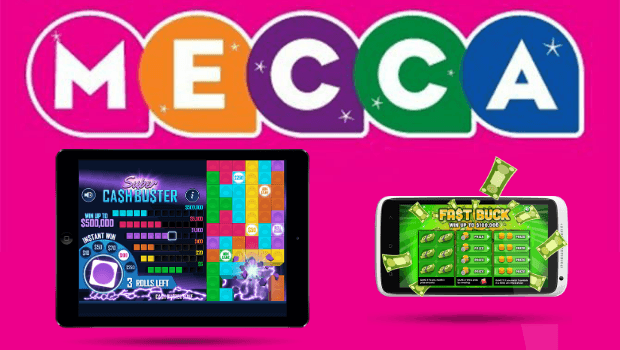 Looking to reinvigorate this section of the online bingo site, Mecca will be expanding its online games after entering an exclusive partnership with IWG, a game development company specialising in developing instant win games! IWG, or Instant Win Gaming, is a world leader in supplying different types of games to the industry, including instant-win games like scratch cards, as well as lottery services and e-instants to run alongside them. Since the company launched in 2011, it has developed and launched over 250 games across the global gaming market. Shortly after the partnership with Mecca was announced, Leon Thomas was named as Chief Commercial Officer of IWG. Thomas has over 10 years’ worth of experience in the industry, having climbed up the ranks at Mecca Digital to become Chief Operating Officer before swapping to Mecca’s new partner. Prior to that he worked at Tombola, as well as enjoying a change of scenery in America, first with Caesars, and then with online slot developer NYX Gaming. What Will IWG Bring To Mecca? IWG will now exclusively develop Mecca Bingo’s entire line of instant-win cash games, including well-known titles such as Cashbusters, Crossword Cash, and Big Money Slingo. However, it’s not only games that IWG brings to the table. "This understanding of the digital consumer landscape has greatly informed our strategy for taking games online. Our mantra over the last few years – and our customers will verify this – has been that any lottery launching an instants platform needs access to a large amount of diverse content, and they will need to update and refresh it frequently. In every territory we have launched, the player data has unanimously backed this up. To engage, retain and, more importantly, grow a player base, you need to meet its appetite for new games, new mechanics, new themes and innovative content." "Online instant-win content is a hot topic at the moment and Mecca realises the importance of providing this type of game to its customers. We all know how successful this content is in the lottery space, but the dominance of mobile as a channel means now is the perfect time to bring instant-win content to the commercial sector." "We’re thrilled to be partnering with Mecca to create this entirely new tab. Mecca is a huge brand and has some really exciting plans for the future. It’s also extremely well-placed, both in terms of players and experience, to ensure this is the huge success it expects it to be." "This is an exciting new development for Mecca’s players. Scratch cards have been around for years, but they haven’t really changed and IWG’s online instant-win content is far more immersive and engaging. We’re going to be promoting this new suite heavily and I’m sure that our players will love the range of games that we’ll be launching shortly." If the IWG partnership with Mecca proves to be as fruitful as its leaders hope, it’s possible that IWG could then expand its games and content insight into Rank’s own Grosvenor Casino brand, introducing new games into that market as well. To check out the new lineup of instant win games, head over to Mecca Bingo today!